A very cool, dramatic, and serious action movie that takes full advantage of the R rating in order to give us the kind of Wolverine movie that we’ve always wanted to see. Exactly what we’ve been hoping for over the years, this movie finally gives us the Wolverine character we’ve been wanting to see. He’s dark and angry and more brutally violent than ever. And this movie gives him good reason to be so upset, facing a bleak future where mutants have all but been wiped out, and where he lives in an abandoned waste land taking care of a badly-aging Charles Xavier. The film works as a road movie, complete with three acts and three memorable action scenes. It also works on a deeper level, putting things into perspective about this character, and allowing him to go out on top. They did it. They finally did it! They got a Wolverine movie right. They found a way to explore the character and what he has been through and what his life has meant to him. It took making an uber violent, adult themed, no-holds-barred movie, to achieve this feat, and considering that this is to be the very last movie for Hugh Jackman playing the character, they really got it right in the 11th hour. Credit that to director James Mangold, a man on a mission, and to Hugh Jackman’s determination to go out on top. Mangold is a masterful storyteller who loves crossing genres, (Girl Interrupted, 3:10 To Yuma, Walk The Line.) He has made some of the coolest movies in the past two decades, (Cop Land, Identity,) and continues to try new things every chance he can get. Mangold also made the second Wolverine movie, the one where the character was in Japan the whole time. And that movie wasn’t all that good. Clearly Mangold was determined to give it another shot and to make sure he got it right. 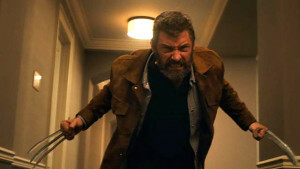 Hugh Jackman, as an actor, is reprising the role that made his career. He found his footing by playing Wolverine in the original X-Men movie. That film existed before the superhero genre. It existed before Tobey Maguire ever put on the tights to make his first Spider Man film. So for Jackman, he was there at the start of the superhero craze. And boy has he seen it change in the past two decades. Jackman has seen the genre go from B movie fun, like the Blade movies, to serious and dark, like Watchmen. He’s seen Marvel studios pilot the idea of a shared universe and bring it the screen so heavily that it could be used to bring back a franchise that was all but dead, (The Fast and the Furious movies, after the second and third film,) and rebirth it as a mega-success story. People often talk about actors staying with roles and how long they’ll stick with something while their fame keeps rising up, outside of that role. It was an issue for George Clooney back in the ER days, with everyone continually asking him if he was going to pull a David Caruso, (from NYPD Blue,) and leave the show. Eventually Clooney did. Not so with Jackman. He knows that the X-Men franchise made him, (he was an unknown Australian actor before this,) and he has continued to play the role for seventeen years.. In doing so, and holding on as long as he has, Jackman has seen and experienced it all. He saw the Dark Knight trilogy make these movies gritty and serious, and he saw Deadpool prove that an R rating can work. Logan is the culmination of all of that. This movie is a thought-provoking hard R of a film. The violence is brutal. In fact, sometimes it feels overly brutal, (like when Wolverine walks around a hotel room using his claws to stab one guy after another in the head,) but that’s okay, because it’s making up for all of the missed opportunities over the years. The story finds Logan living in an abandoned smelting plant, in Mexico. He has two companions, a seizure-prone Professor Charles Xavier, (Patrick Stewart, reprising the role for the very last time,) and Caliban, an albino mutant tracker, (played by Stephen Merchant.) Logan hides the sickly Professor in a fallen water tower, where Logan tends to the old man and helps watch over him. A lot has changed since we last saw these characters. No new mutants have been born in about twenty-five years. The three of these guys live far away from society in a desolate wasteland, just trying to survive. 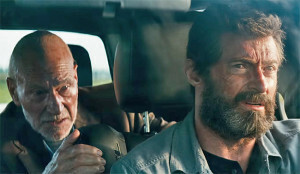 Logan drives a limo in order to get money to buy Charles’ prescription medication which stops him from having seizures. And the reason they ended up out here is because Charles had one of those seizures at the X Mansion, in an event known as the Westchester Incident, and it killed a whole ton of people including the remaining X-Men. We hear multiple accounts of this situation as fragments of a story that we never get to see. It’s back story for these characters, to help explain how they ended up out here and why they are in hiding. So Logan decides to help, with Charles encouraging him to take Laura in, as much as possible. That brings us to our first attack by the Reivers, as they show up at the smelting pot location and get a deadly surprise. Laura is both super strong and incredibly violent. She takes out a whole bunch of armed Reivers, all on her own. Then she and Logan and Charles escape. Only the Reivers capture Caliban and begin to torture him for answers. Now the film becomes a road movie. At least for a little while. Logan and company, representing a three generational family, with Charles being the grandfather, meet a family on the side of a road and help them out with some escaped horses, (gotta love the shots of self-driving trucks on the road here.) The family, called the Munsons, then invite the three of our protagonists over for dinner. It isn’t long before the Reivers catch up to them and attack. This gives us our second act of the movie and our second major action scene. The first was when the Reivers showed up in the desert and the second is their visit to the farm. And there are some major surprises here. To say any more would be to give spoilers away, so I’ll just say that it’s a true testament to how cool this movie is that it doesn’t show us anything of who else comes after Wolverine, besides Pierce. Other superhero movies have made the terrible mistake of using the trailer to show us moments from the ends of their movies, and give major villain plot points away. The Amazing Spider Man 2 pretty much lied to us with what the trailers showed of the Rhino, when really we only got to see a part of the scene in question, in the final moment of the film. More recently, Batman Vs Superman used its trailer to give away Doomsday and show the heroes join forces to take this villain on. Don’t these movies know that if the villain is left as a surprise, audiences will love it, freaking out over how cool and unexpected this was. Logan knows. Whereas those other movies gave away secrets of their endings, Logan’s trailers don’t even give away secrets from it’s middle. Now that’s pretty cool. The third and final act becomes about whether or not Laura can get to Eden and get across the border to Canada. It’s the end of the road trip situation, and pretty cool in both the way that it closes all doors which tied to the movies that came before this, and yet opens a new door of possibility, should the franchise want to continue into the future. And the ending action scene is as violent as any that came before it. Pierce is a cool villain, but what’s really neat here is that he is not alone. Like some of the better superhero films, (such as Batman Begins,) this movie offers multiple villains by connecting them all together in a way that feels natural to the story. This movie avoids the cliches of having villains simply team up, (like Batman Returns, Batman Forever, Batman and Robin, and the Dark Knight rises all did.) Instead, it has a story that naturally evolves into the villains being on the same side without in any way seeming forced. At it’s heart, Logan is a movie about family. This movie is about relationships. With Logan and Laura, it’s a father-daughter like relationship with the man realizing that there’s some good he can do to help out the future of mutant-kind. With all but this last group of mutants left, (there are a handful of mutant kids,) the movie seems to be in the same vein of a bleak future as Children of Men, a movie where no new babies have been born in years. But aside from that relationship between Logan and Laura, there’s also the one between Logan and Charles, and between Charles and Laura. The one between Logan and his former teacher are especially interesting. Here, in this future, Logan has devoted his life to taking care of the old man. The movie nicely captures that connection and also gives us a number of call backs to the original films and their past experiences together. Charles talks about finding Logan in a cage match, back when they first met, for example. There’s a mention of the Statue of Liberty incident from the first film. The only thing missing is any mention of the other X-Men. That’s one small area where this movie could have been improved. A mention of Magneto or Jean Grey or something, would have been nice. That’s all. But this movie wants to exist on its own, and be more like a western than a usual superhero film. And you can’t really blame it. . After all, the inclusion of too many mutants was the downfall of the Japanese Wolverine film. With this movie, Mangold gets to call all the shots, and he’s the perfect guy for the job. Apparently both he and Jackman told the studio that they would only make the movie if they could do it their way, (which meant an R rating, and total control of the story, among other things,) and the studio agreed. Thank goodness for that. This movie is basically the definition of going out on top. It’s exactly what a Wolverine movie should be, and leaves nothing on the table. What a great film.